Miso is a salty paste that originates in Japan. It is made from soy, fermented and aged with varying amounts of added rice, barley or buckwheat among other grains. Miso can be used for sauces, spreads, and marinades, but it is most commonly eaten in soups and stews, where it is added to dashi, a stock made with kombu as in the sushi bar favorite, miso soup. The three most common types of miso are Shiromiso (white miso), Akamiso (red miso), and Awasemiso (a mix of red and white miso). Macrobiotic cuisine tends to use aka (red) miso, while shiro (white) miso is what you’ll find in most restaurant miso soups. Despite the controversy over soy and breast cancer, recent research has found that soy products are safe for breast cancer survivors to eat and may even help lower PSA levels for men at risk for prostate cancer. That said, miso is a fermented food, and for cancer patients on a neutropenic diet, miso and all miso products are best avoided. But for those who can eat it, miso makes a great addition to a veggie based diet. Miso is a probiotic food and high in protein, fiber, Vitamin K, copper, and manganese. Though there are many health benefits associated with miso it is also very high in sodium and should be consumed in moderation. We love miso! As a rule, the darker the color of miso, the deeper the taste, and the longer it has aged. The taste of miso can range from very light and almost sweet white shiro miso to earthy, pungent, dark brown hatcho miso. 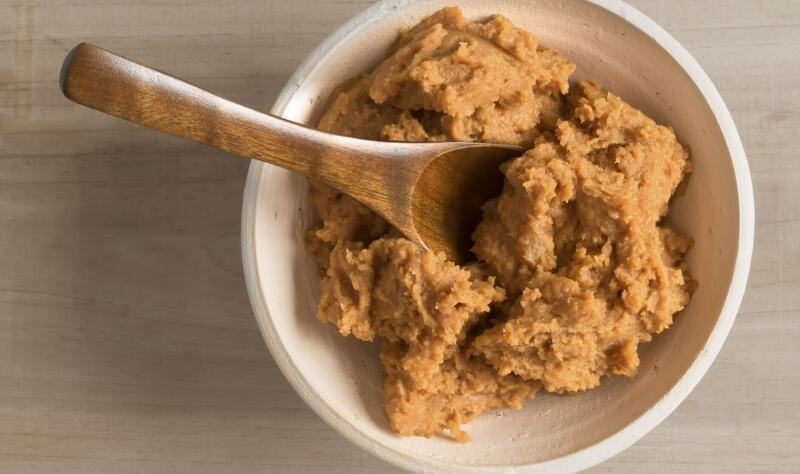 For those who are unfamiliar with miso paste, we recommend starting with sweet, white shiro miso. Its flavor is very approachable and you’ll be surprised how many recipes you can add it to for a delicious salty-sweet punch. You should be able to find miso paste at any Asian specialty store, or in the macrobiotic section of the health food store, or in the supermarket near the tofu. Miso comes in relatively large tubs, but don’t fret, because it’s already fermented, it does not expire. Just make sure to keep it refrigerated and well sealed so it doesn’t dry out. Mariko Makino, our recipe developer, hails from Japan and has introduced many healthy, plant-based recipes to CFYL using miso paste. For starters, try making your own nourishing Miso Soup by stirring miso paste into dashi, an easy broth made with kombu. Also try making our Miso Lime Sauce to flavor cancer-fighting veggies like broccoli and bok choy, or stir a teaspoon into our basic vinaigrette to add extra protein to a salad. Spread miso onto tofu in our Tofu Miso Sandwich, or make a healthy dinner with our Spicy Miso Fish “En Papillote.” For a quick, protein rich snack try spreading our Honeyed Miso Peanut Butter Spread on a slice of whole grain bread or apple slices. Yum! A note of caution: if you’re adding miso to soup, stir it in at the end, and just heat it through. Boiling miso will destroy its probiotic enzymes.